This necklace pattern repeats a four column vertical netting design multiple times to create a necklace collar. This type of necklace may have originated in tribes in Africa, thus the name African net. Traditionally, collars of this type may use multiple bright colors of beads used to accentuate the rows or pattern of the beadwork. However, it is easier to learn the stitch pattern if you use a single color of beads. There is a lot of counting involved in keeping the pattern correct. Once you are familiar with the pattern, then it can be time to branch out into using different colors. To give you an idea of how much time a necklace like this takes to make, each section of netting takes between 10-20 minutes to make depending on the type of beads you use, how quickly you bead, etc. 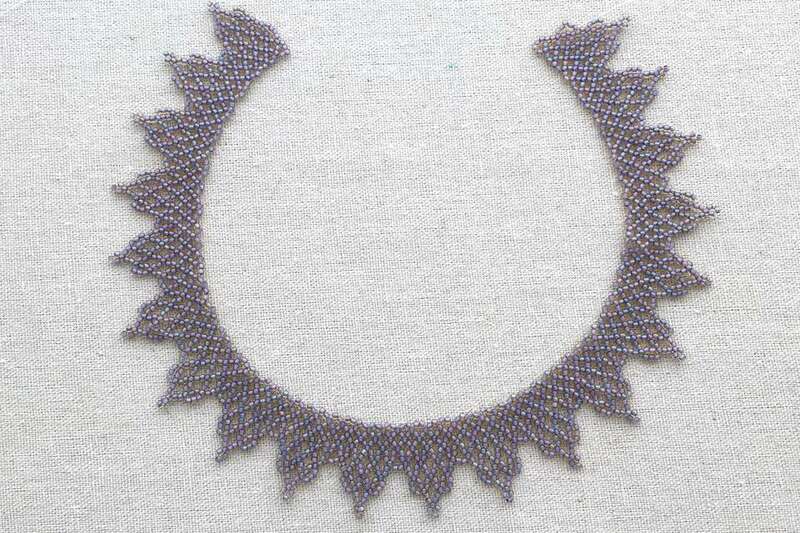 The necklace collar and step by step instructions both use size 11 Toho round beads. The collar uses transparent light topaz beads with an opaque lavender lining. They are beautiful beads with subtle coloration but I don't recommend you start with beads like these. A matte finish solid color opaque bead like you see in the instructions works best for beginners. It is easier to differentiate between the beads and see the holes - which is very important with this stitch. Make sure you have at least 30-40 grams of beads before you start this project. For thread, you can use a nylon thread prepared for stitching like Nymo or a fishing line like FireLine. FireLine will result in a stiffer necklace while Nymo will result in a soft draping weave of beadwork. Both are strong, but Nymo is more likely to stretch. Choose a beading needle for the size thread and beads you are using. Tulip beading needles in size 11 seem to work for most tasks. Start your netting by stringing a stop bead. The stop bead will become part of your beadwork, so make sure it is the same type of bead that is used in the rest of your design. Leave an appropriate sized tail thread that will allow you to add a clasp later, usually at least 6 inches. Pick up 11 beads and go back through the seventh bead from the end. Pull the thread to form a loop. This step is only done when you start the beadwork. Future netted sections will work off of beads in the prior section. Pick up 4 beads and go down through the fifth bead. If this is your first component, the fifth bead is the stop bead. Pull beads tight. Pick up 9 beads and go back through the seventh bead from the end. Pull thread tight to make a loop. Pick up 5 beads and go through the sixth bead above where your thread is exiting. In the pictures accompanying each step, you see the shape achieved from the prior stitch, the new beads on the thread near the beadwork and the location the needle is going through for the current stitch. Pick up 3 beads and go up through the fourth bead up from your thread. Every column in this netting component ends with picking up 3 beads and stitching into the 4th bead up from your thread. Pick up 4 beads and go down through the 2nd of the 3 beads you just added. This stitch is used in every column to transition from one column of beadwork to the next. In this case, you are moving from the left column to the center picot column. This stitch will often pull the tension of your beadwork loose. Be sure to hold the beads and thread to keep everything snug next to each other. Pick up 4 beads and go down through the fifth bead down from the bead your thread is coming out of. Pick up 5 beads and go down through the sixth bead down from your thread. This bead is easy to spot since it is at the end of the column. Pick up 6 beads and go back through the fourth bead from the end. This makes a 3 bead picot on the end. Make sure to keep the tension tight here. This is also a good place to customize your collar necklace by adding a crystal bead instead of the picot. Instead of picking up 6 beads, pick up 3 beads, a crystal, and one more bead. Stitch back through the crystal bead, skipping the last bead. That will put a crystal bead in place of the picot. Crystals that are 3-4 mm in size, particularly bicones, work well for this. Pick up 5 beads and go up through the sixth bead up from your thread. Pick up 5 beads and go up through the sixth bead up from the bead your thread is coming out of. It is easy to split the thread when you are going through on an angle. Try to pull the bead up and keep your needle on the top edge to avoid going through the thread and weakening your beadwork. Pick up 3 beads and go up through the fourth bead up. This is the end of the column. Pick up 4 beads and go down through the second of the 3 beads you just added. This is the turn to start a new column. Pick up 3 beads and go up through the third bead of the 5 you just added. This is another loop that can tend to pull the tension loose. Pick up 3 beads and go through the fourth bead up. You may recognize that this is the end of the row. One thing that may help here is to make sure there are two beads to the left, above the bead you are stitching into. If not, retrace your steps down the column to figure out what went wrong. You may recognize this is the turn at the end of a column. Pick up 4 beads and go down through the fifth bead down. Pick up 5 beads and go up through the second bead from the top of the 4 you just added. This is the last turn for the component. You have finished one netting section. Return to the instructions for the left column, step 1 and continue all the way back to this point. To help you make additional sections of the African netting beadwork more quickly, except for the turns, you are always skipping the same number of beads that you're adding for the stitch. So, you pick up five beads and stitch into the sixth bead (skipping five beads). After stitching a few components, the netting diamonds begin to take shape and it will feel like the right bead is sometimes poking out waiting for your needle. Count anyway! And always check your results at the end of each column. It is easier to remove mistakes if you find them right away. Add a handmade peyote stitch toggle clasp or a beaded loop and button clasp to complete your design.